Beautiful property with quiet, well-maintained beach We stayed with another couple for 3 nights. We used the kitchen each day and found all of the dishes and cookware that we needed. The views were awesome and the pools were quiet and perfect for us. The bedrooms were large and the beds comfortable. Our only complaint was about the Princess fitness room. My husband tried to use the exercise bike twice. It was broken the first time and he reported it to the office. They said they fixed it, but the very same thing happened the next morning. Overall, the condo was Excellent!! It is beautiful and very spacious, and I will stay there again! The check in process was so nice. All I had to do was speak with the owner/property manager, and everything was waiting for me in the room. The condo itself is gorgeous! And had more than enough room for 9 adults to sleep comfortably. My only complaint is the cable and WiFi were subpar. I was there opening weekend of college football, and the cable was skipping really bad, and the WiFi didnt work. Normally I dont watch tv at the beach, but I wanted to watch some football. It wouldnt stop me from staying here again though. I did report the cable issue, and Donna came to see it, but it was intermittent and not constantly messing up. I didnt want to deal with it anymore after the first time I reported it so I didnt pursue it. She was adiment that she would work to get it fixed if it continued, but I just didnt report it. Great get away We stayed here and loved it. Everything was clean and the condo is nicely furnished. It is very roomy, you do not feel like you are in close quarters at all. The kitchen is furnished with all you will need, plenty of bathroom linens also. Full size washer and dryer so everything was washed and dried before we returned home. I highly recommend this condo. Jennifer was a pleasure to deal with, we will rent from her again. Great condo August 2018 Love the location. The North end seems less busy. Close to grocery and novelty shopping.The unit was clean and ready upon arrival. Positives: big laundry room, bedrooms have a bathroom for each. Master bedroom has balcony access. One negative is the air conditioner filter needed changing. AC worked fine just noticed it needed changed. Fantastic location just steps from the beach! 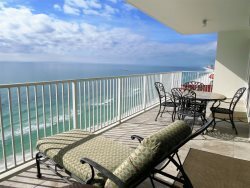 We had an amazing time in PCB and this condo was a big part of it! Jennifer and Donna were great to work with before and during the stay, answering any question I had. I was impressed with how clean the condo was, which was really important to me. The entire complex is maintained well, which was great too. My favorite part was that we were literally steps from the beach. So convenient! The unit comes with two rental beach chairs and we used them everyday. Plus there are extra portable beach chairs provided, which was a nice touch. Another great feature we enjoyed was the balcony. We took some pretty amazing photos of the sunset from there! The location of the condo worked great for us too. Close to shopping, restaurants and lots of activities for the kids. It was definitely hard to leave this beautiful place! We will for sure be back and would stay in this unit again in a heartbeat! Beautiful! Perfect for the 9 of us! Beautiful condo, spacious, great location. Wonderful stay! Spacious, gorgeous view, and super clean. Highly recommend - will definitely be back! Absolutely a great stay!!! The unit is spacious, clean, and well maintained. Everyone in my party was comfortable. I am really impressed with the property managers. The team is very proactive in providing vital information regarding entry codes, parking passes, and other important information ensuring the tenant is well informed of all the procedures of the rental. All questions were answered promptly. Great Condo, Great Staff! Ill definitely be returning! The property was clean and well taken care of . We absolutely loved the condo 905! Loved the gated condo , Our family felt very safe ! We had 2 days during our stay where we had a double red and a single red day . The 3 pools made these days with the kids very enjoyable. Made less of a let down for them ! Also having 3 pools help lessen the crowds! We very much enjoyed the 2 beach chairs that came with the condo . And the many coupons that came with vip was a huge bonus! The overall cleanliness of the resort was pretty impressive! The 3 elevators was a plus we never had to wait on one . We loved this condo . We will be back! Clean, comfortable and relaxing! We had an amazing vacation! The property was spacious and very clean. Jennifer and Donna were both very accommodating with phone numbers in case we had any problems or concerns, and of course there were none! Could not have asked for a better stay! Thanks so much ladies for sharing your vacation property with us and making sure we felt so welcome and at home!! Hope to visit with you again in the future!! Great place! The condo was great! Very spacious. My family and I really enjoyed being there. We will go back again. Everything was beautiful and very clean! Book this condo, you wont be disappointed! Excellent Wonderful stay, couldnt ask for a better experience. Loved it!! Amazing!! Was a wonderful stay and the managers were amazing and on top of everything. The beaches were beautiful and not packed. Would definitely stay again!! Great Vacation The penthouse is awesome! Right on the beach. Located perfectly in the strip. It almost made me feel bad for other vacationers that were staying in other condos! I highly recommend. Great stay! Condo was beautiful and had everything we needed. Donna & Jennifer from rental company were great to deal with- very pleasant & answered all questions. Would love to go back again. Clean and comfortable for our party of 9 Accommodations were very clean and comfortable. Everything seemed well kept. Jennifer and Donna provided us with all the information we needed which made us feel at home. We really liked that it was located in less busy area. Loved our stay there and would enjoy coming back again. We love the Princess! We had unit 204 a week in July 2018. We have stayed in this unit before, and at The Princess many times. I have also stayed at many other condos over the years, The Princess is our top place to stay. This unit is super nice, clean, comfortable, and has everything you could need, free chairs etc. Parking is great, and it is always calm and peaceful here. Owners very helpful and quick to respond if there is an issue. Amy C.
Great stay!!! Beautiful condo. Spacious, easy access to elevator and trash disposal!! Great views!! Short distance to ocean!! Great stay! Property was in excellent condition. Very clean. Donna and Jennifer were very easy to work with. The Perfect Condo! The condo was absolutely perfect! All of the rooms provided the space we needed and no one felt cheated on the bathrooms! The views were spectacular from the master suite and the main living area. The large balcony was a great place for the kids and adults to hang out. Would definitely recommend! Spacious and Extremely clean upon arrival. Great place to stay. Spacious and clean. Never waited more than a minute for the elevators. There are few condos for this size of complex, which made it great. Never had to deal with an over abundance of people trying to find a spot on the beach. Will stay here again!